Essentially a “plein air” painter, David Curtis is inspired by the landscape and the ever changing light. Here we see him painting in the dramatic scenery of the Lake District and on the north coast of Cornwall. Selecting his subjects carefully he achieves drama and a wonderful feeling of light and mood in his paintings, capturing the essence of his subjects..
David Curtis is a master of plein-air painting and in Atmospheric Watercolours: Painting on Location we find him painting in a cold, rain-threatened Lake District and later in much milder conditions in Cornwall. David shows how to select interesting ideas, how to deal with changing light conditions and, above all, how to work quickly and confidently and make the most of the time available. Sound drawing always underpins his work, which is subsequently developed with his trademark ‘ghost’ wash and then the necessary defining washes and detail, always with tone and colour relationships in mind. This is an excellent film, full of advice and inspiration. 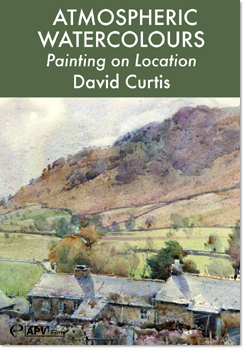 It's always a pleasure to watch David Curtis at work and this latest DVD, Atmospheric Watercolours: Painting on Location is no exception. Starting with the rugged landscape of the Lake District on a very cold spring day, David tackles a group of barns nestling in the valley, with the fells rising behind. ln such inclement weather and with few hours of sunlight, David shows how to encapsulate the essence of the scene, with strong assured drawing and an emphasis on tonal washes. David explains: "lt's all about teasing paint along a surface and making it work for you." Easier said than done, but he makes it look simple and after two-and-a-half hours of fighting against the cold, he completes his watercolour and manages to maintain the beautiful light effect that first attracted him to the scene. A dramatic cliff face with a white house dwarfed by the mountains above follows, before we move to the sunnier climes of the north coast of Cornwall for some harbour and clifftop paintings. 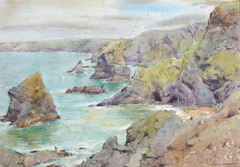 The DVD complements the book Painting on Location published by Batsford. Both are sure to inspire. If you’re already a fan of David Curtis, you know what you’re expecting and this new film won’t disappoint. 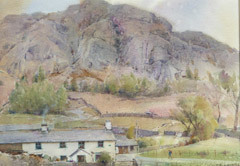 David is a master of working on location, of plein air painting, and he can produce results, in inhospitable conditions, that many artists would find hard in the comfort of the studio. His trick, if it is one, is to create an impression, to suggest details and atmosphere, inviting the viewer to fill in what they expect, rather than to record a scene in detail. His skill, of course, is to get that viewer to expect the right thing, and that’s all in those magnificent washes. There are six paintings here, if you count intermediate sketches, which I think we should as most of us would call a work like that a painting and happily hang it on the wall. Locations are divided between the Langdale Valley in the Lake District and North Cornwall. Various details stand out: the use of washes I referred to earlier, a comment “This needs to be built up gradually. I don’t want to get into the dark too early, for fear of losing the way”, and David’s use of masking fluid to identify, define and protect what will be significant details right from the very outset of working. When the paintings seem just to coalesce out of a series of variegated and graduated washes, this amount of foresight and planning is significant. This is, at two hours, a generous film and David is also generous with his time and commentary. In my opinion, the best yet. Masterful and inspiring.